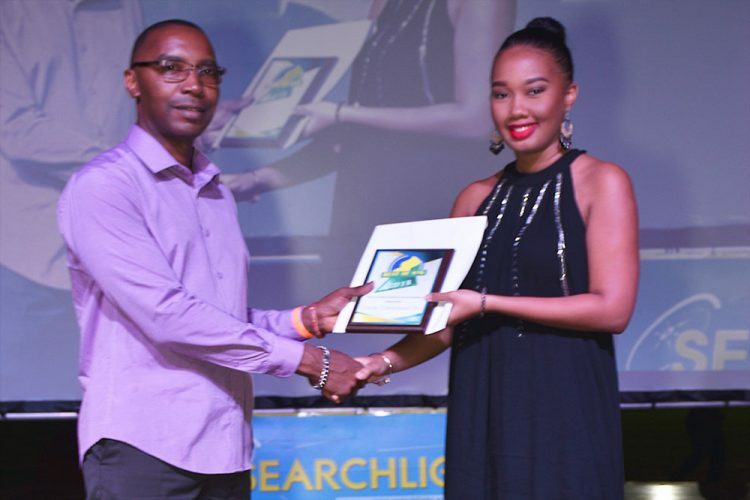 Chelsea Alexander, daughter of Dollis Alexander of ‘Touch of Dawn’, receiving the award for Best Cocoa Tea at the Best of SVG Awards ceremony in May last year. Within the last two years, Dawn’s touch has extended to the kitchens of people living in various countries across the world. But it was the people of St Vincent and the Grenadines who voted the product Best Cocoa/Chocolate tea in the 2018 Interactive Media’s Best of SVG Awards. Dollis Alexander, who is affectionately known as Dawn, told SEARCHLIGHT that the idea for her business , ‘Touch of Dawn’ came shortly after she was retrenched from her job as a principal of a private school in 2015. “I was home partially enjoying the freedom, but being mindful that ever since I was 18, I was earning an income. I started thinking, what could I do? What skills do I have that I can keep myself meaningfully occupied and that just hit me. Around the time, there was all of this move about cocoa and the renewed benefits that people were talking about and that’s how I got into it,” she said. Although she had no prior hands on experience with making chocolate, Alexander recalls watching her mother execute the entire process when she was younger. Back then, her role consisted of shelling the cocoa and getting it ready for the grinding on a manual mill. 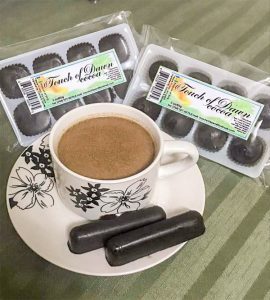 The entrepreneur explained that the name of her product “is about awakening and you can awaken to a nice cup of hot cocoa tea” and she describes it as “really invigorating”. It would appear that Alexander meant business as she set out doing her own market research in an effort to figure out where she could position herself in a small yet saturated market. She revealed that she bought local chocolate sticks from the store to compare the look, the taste and the texture of the products. And because she was determined to stand out among the competition, Alexander not only focused on taste, but also placed a great deal of emphasis on presentation and packaging. The Murray Village resident also guarantees that her cocoa dissolves so there isn’t “anything to strain because of the process I use to refine it”. She also revealed that her husband, Sebastian ‘Bassy’ Alexander has found other uses for the product. “We’ve tried at home some other uses, like Bassy has come up with a wonderful milkshake. Traditionally, cocoa tea as we call it is something that we drink hot. It’s a hot beverage. But we figured, this should be able to make a lovely chocolate smoothie like. Remarkable; the outcome,” Alexander told SEARCHLIGHT. The entrepreneur further revealed that ‘Touch of Dawn’ is really a little family venture as her husband often helps to with milling the cocoa. While many other cocoa products come in stick form, Alexander has used moulds for her cocoa. And persons may buy the product in the shape of hearts, shells and even SVG. This, she says, also helps to minimize the human contact with the product. Alexander told SEARCHLIGHT that winning in the Best Cocoa/Chocolate tea category was a “feel-good moment”. “It still is a feel good moment. I know – because I see them on the shelves too – I know that there are other people who make the cocoa and it was an added inspiration. I didn’t expect to, but I’m glad I did and I appreciate that because it stimulated an awareness and it inspired me to try and get better at it. So I’ve been trying to get better,” she said. “Quite a bit of people would meet me and say, ‘I didn’t know you make the cocoa. Congratulations, etc.’ I use it to advertise. In fact, the folks in New York had an exhibition and a friend of mine actually took some up and had a little booth. She actually made the tea and sold quite a bit. Alexander added that she has received many inquiries from people both locally and abroad and that she has even had to fill an order from a man in Australia. She also said that her cocoa has been taken to other countries including England, Canada, Taiwan, Trinidad, Barbados and the Virgin Islands. And while she hopes that she will continue to expand and service interested people abroad, she is still interested in reaching a wider market locally. ‘Touch of Dawn’ products are mainly sold in Greaves Supermarket and Bonadie #2.